Here at Thomas Brothers Funeral Directors in Wellington, we pride ourselves on the level of commitment and quality of care we offer to you. Allow us to provide your loved one with a funeral that is a reassuring and dignified reflection of their memory. Our recently refurbished funeral home is situated on the High Street in Wellington, making us easily accessible to nearby locales and those further afield. These include Tonedale, Rockwell Green, Nynehead and Milverton. We are a funeral directors that believes your wishes regarding the funeral are what matter the most. That is why we promise to tailor the ceremony to your preference, allowing you to shape your loved one’s farewell specifically to how you want it. That is not to say we will leave you to make these decisions alone. We will be with you every step of the way, providing advice and guidance should you need it. You and your family will be treated with compassion and care at all times and our friendly team will offer understanding at what can be a difficult time. If you wish to spend some time with your loved one, we have a comfortably appointed chapel of rest available. This peaceful and private space will allow you and your family some moments of quiet contemplation before the day of the funeral arrives. 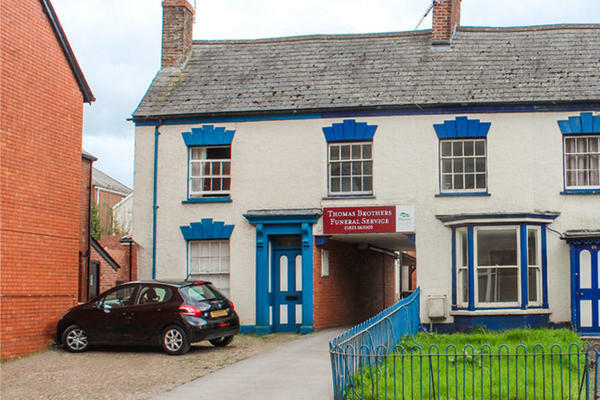 Thomas Brothers Funeral Directors has been an established presence in the Taunton Deane district since the 1960s. We are available to talk 24 hours of the day. Call us today on 01823 662009 to talk through your personal requirements. At Thomas Brothers Funeral Directors, we understand how special life is with those that you love. For us, every funeral is unique and personal. We have a service to fulfil every wish, with every detail carried out with the same uncompromising quality of care. From a traditional service, to a colourful woodland burial, your options are limitless with our Full Service Funeral. If you have a little more flexibility when it comes to arrangements, then we can provide a Simple Funeral for a lower cost. Please call us before your visit and we will advise you on parking. We are located opposite St. John the Baptist C of E Church. Our staff are available 24 hours a day on 01823 662009 if you require our services outside of these hours.